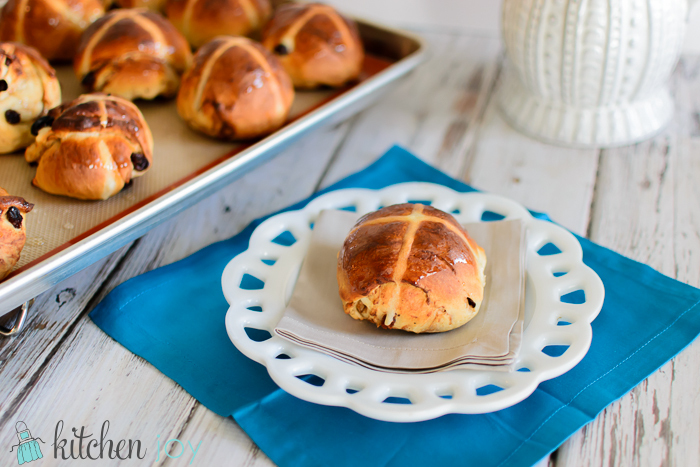 Hot Cross Buns are a Good Friday tradition dating back to the days of Queen Elizabeth the First, and probably even earlier. 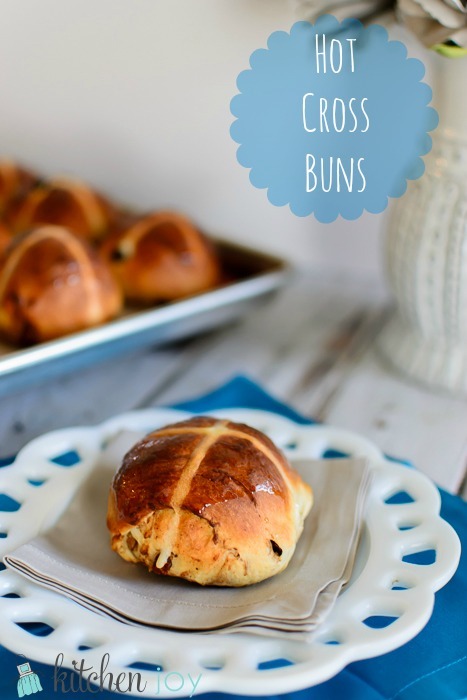 It is my understanding that at that time, the sale of Hot Cross Buns was forbidden unless it was Good Friday or Christmas. Those caught disobeying the order would be forced to forfeit the contraband buns and give them to the poor. This prompted people to begin making them at home instead of purchasing them. The store-bought Hot Cross Buns I’ve had in the past were nothing particularly memorable either. There are a few different accepted techniques/variations for Hot Cross Buns which are largely a personal-preference issue it seems. Understandably so, people seem to think the version that their mothers and grandmothers made them every Easter season is the one and only right way to make them. Some use currants, some raisins, some a combination. Some make the cross by scoring the dough with a knife, some use icing to make the cross, and others use a flour mixture to make the cross. Egg wash, no egg wash. Sugar glaze, no glaze. The possibilities are endless. Go with your gut. If you like things heavier on spice, add a bit extra. 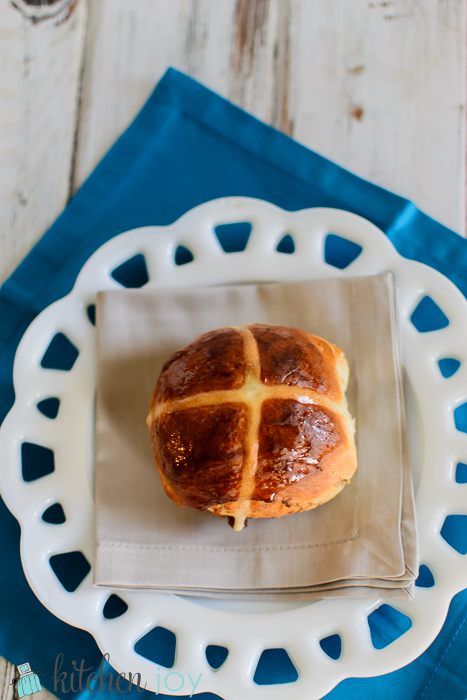 I have no such pre-existing notions of the ideal Hot Cross Bun. 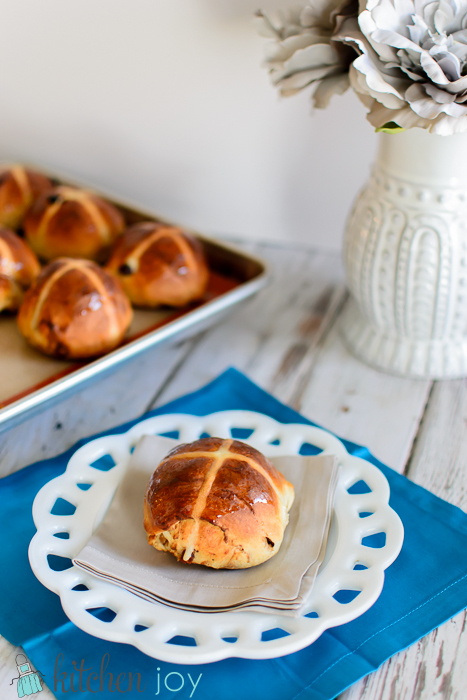 I set out on my little Hot Cross Bun project with an open mind, and an arsenal of flour, spices, yeast, and raisins. Let me tell you, it was well worth the effort! I tried several variations, and this is the version that Hubby and I liked best. This version uses a flour mixture to bake the cross shape on the top, and then is glazed with a sugar syrup immediately after baking, giving each bun an irresistibly glossy, sweet exterior to these perfectly spiced yeast rolls. There are three scenarios in my life in which I consider raisins to be an edible substance…Cinnamon Raisin Bagels, Cinnamon Raisin Bread, and Hot Cross Buns. A new Good Friday tradition has begun at our house. What more perfect symbol could there be on the day we spend remembering and honoring the death, and subsequent resurrection of Jesus Christ than a cross? It seems to me to be a much more appropriate symbol of the Easter season than fake green grass and people dressed as bunnies. Just saying. These can be prepared the night before serving, if you wish. Simply prepare the recipe according to the directions up to the point when it is time for the second rise, then refrigerate. Remove from refrigerator in the morning, about 2 1/2 hours before you would like to serve them, then allow dough to rise (second rising), and continue with the recipe directions. In a large bowl of a stand mixer, whisk together the bread flour, yeast, sugar, and salt. In a small saucepan set over medium-low heat, heat the butter and milk together until the butter has melted and the milk is warm, about 100 °F. Place the dough in a lightly oiled bowl and cover with plastic wrap and a tea towel. Allow the dough to rise in a warm place until doubled in size, about 1-2 hours. Cover the buns with plastic wrap and a tea towel and allow to rise again for an hour or two, until they have doubled in size. When the buns have risen, make a paste with the all-purpose flour and place in a piping bag (or a re-sealable plastic bag with the corner cut off). Pipe a cross onto each bun with the flour paste. Bake the buns in the preheated oven until golden brown, about 15-20 minutes. When the buns are almost done baking, combine the sugar and boiling water to make the glaze. Remove buns from oven and brush with sugar glaze immediately. 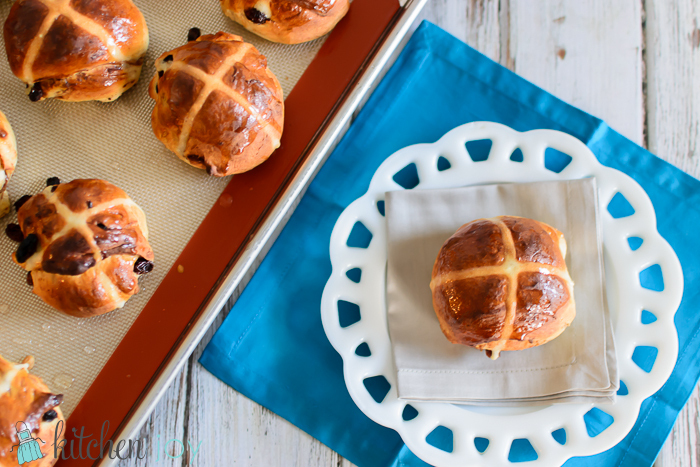 Note: Hot Cross Buns are best when enjoyed the same day they are made.